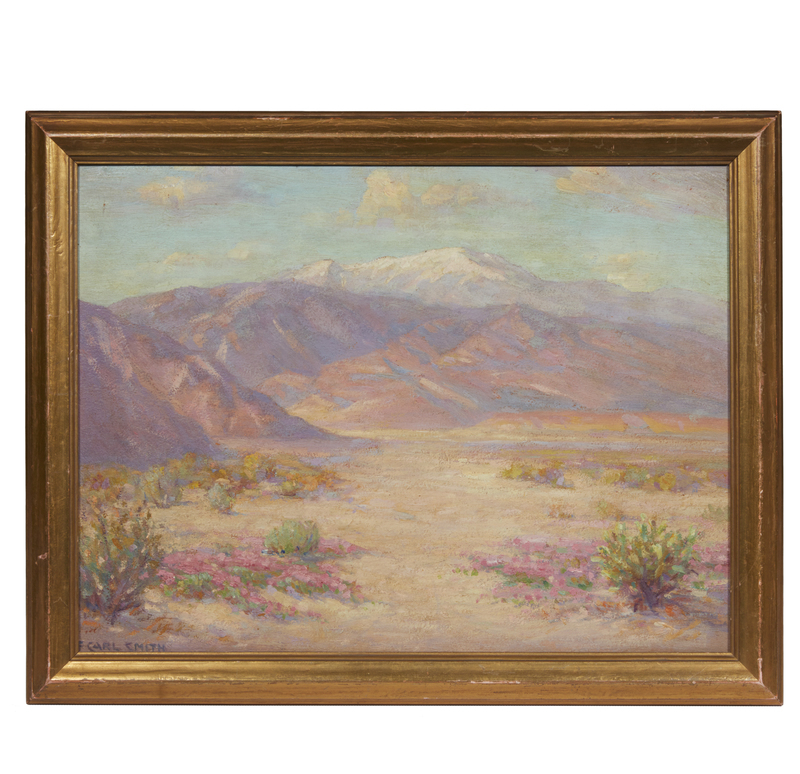 Painting, Frederick Carl Smith (1868-1955), "Colorado Desert"
Framed oil on board painting, "Colorado Desert" by Frederick Carl Smith (1868-1955) depicting the Colorado Desert in Palm Springs, CA. (The Colorado Desert is part of the Sonoran Desert in California). 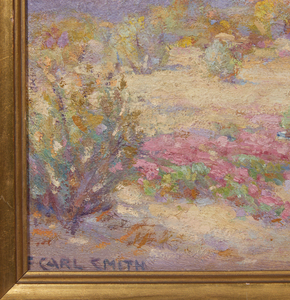 Signed lower left, "F. Carl Smith". 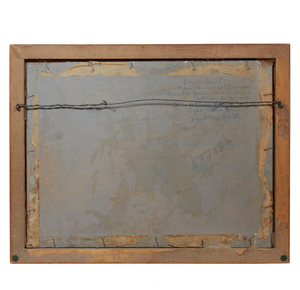 Handwritten verso, "Colorado Desert / Palm Springs California / Desert in Spring, Sand Verbenas / Mt. San Georgornio / To my esteemed friend / Cat. Canaga / from F. Carl Smith." Dimensions" 12"h x 16"w; (framed) 14"h x 17.75"w. Smith was born in Cincinnati, worked in Washington D.C. then relocated to Pasadena, California and was active in the Laguna Beach art community. Processing and shipping within the continental U.S. $45.00 plus 1.5% replacement cost insurance. 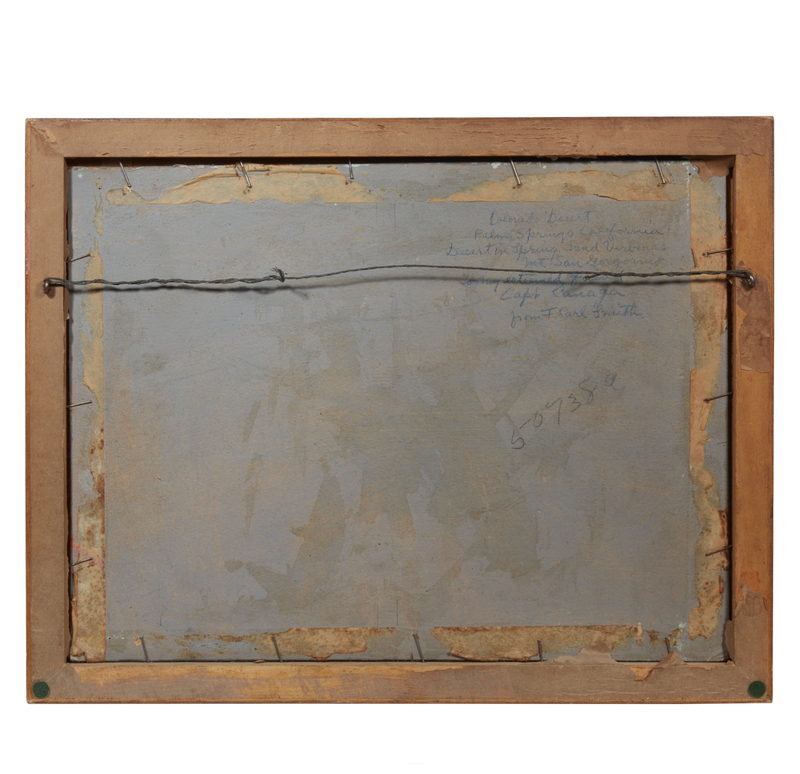 Good with some wear to frame. Witherells strives to provide as much information and photographs as possible but encourages in-person inspection by bidders. Condition statements are only for general guidance and should not be relied upon as complete statements of fact and do not constitute a representation, warranty or assumption of liability by Witherells. All lots are sold "AS IS" under the Terms & Conditions.